We have conducted our annual survey to improve our service to the end-user community. Respondents were asked for their opinions on various topics related to anti-virus software testing and anti-virus software in general. We would like to thank everyone who took the time to complete the survey. The survey only ran for 10 days this year. It contained various control questions and checks which helped us to identify and remove nearly 1,000 invalid responses from just a few users who tried to game the survey, presumably to win a licence; these were all disqualified and removed. The survey results are invaluable to us. This report contains the results of the survey questions. Use of the Internet by home and business users continues to grow in all parts of the world. How users access the Internet is changing, though. The increase in the use of smartphones and tablets to access the Internet has continued, and this has resulted in a drop in desktop and laptop sales. With regard to attacks by cyber criminals, this means that their focus has evolved. This annual survey of computer users worldwide focuses also on which security products (free and paid), operating systems and browsers are most widely used. Report results are based on the Internet survey run by AV-Comparatives between 14th December 2018 and 24th December 2018. 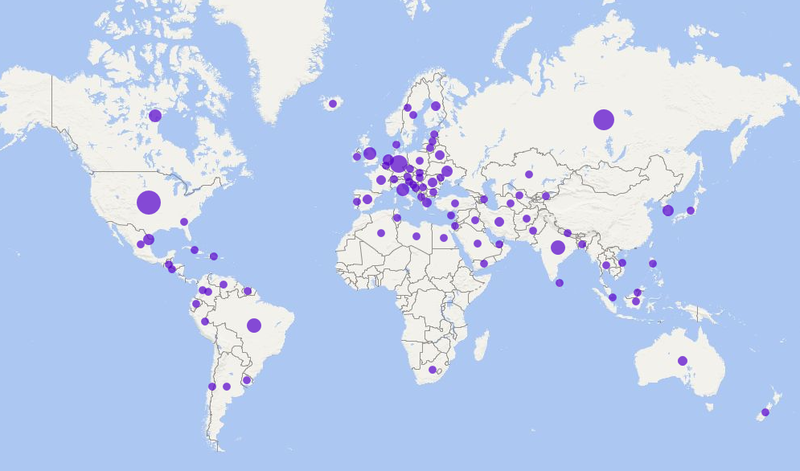 A total of 3,302 computer users from around the world answered the questions on the subject of computers and security. This year, to say thanks for taking part in the survey, about every third randomly selected participant will get a one-year license for a security product. The licences were kindly provided by their respective vendors: Avast, Avira, ESET, F-Secure, K7 Computing, Kaspersky Lab, Panda and Trend Micro. Our thanks go to these manufacturers for making the licences available. Please note that all the points made below refer only to our survey participants, not the general public. Avast, Bitdefender, ESET, Kaspersky Lab and Microsoft (ordered alphabetically) are the five most popular desktop security products worldwide, and feature in the top five products on every continent with significant results. Kaspersky Lab is the most popular mobile security solution in absolute number of votes, while Bitdefender and ESET are the only two found in the top three on every continent. 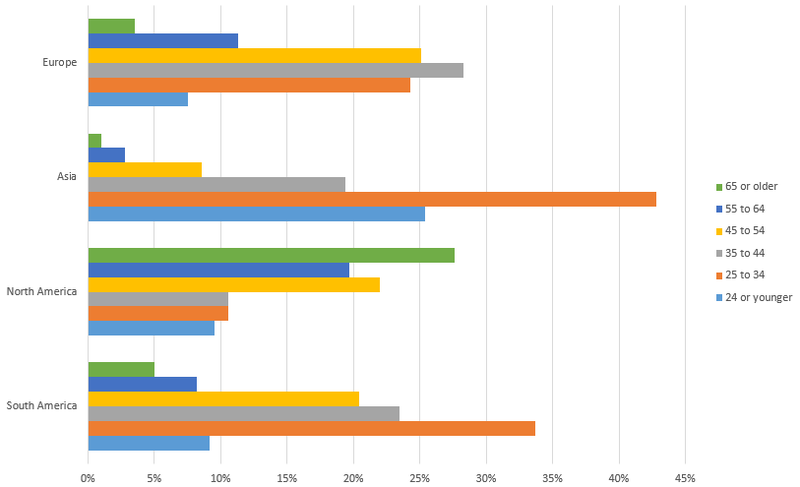 Android remains by far the most popular mobile operating system, being used by four fifths of respondents. iOS is the only other mobile OS to reach double figures, at 15%. 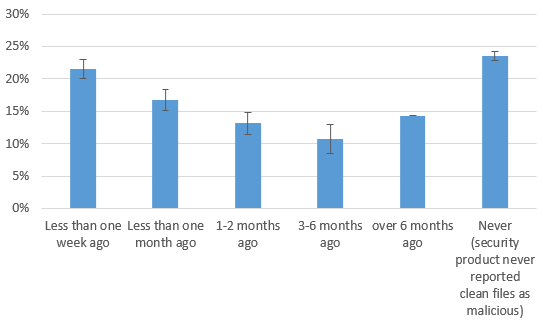 A majority of users (86%) were well protected in the last 6 months, having not suffered a malware infection in this period. A little over a third (35%) stated that their security product had blocked malware within the last week, indicating how easy it is to encounter a threat. The number of users who rely on free desktop security software has risen again this year, standing at 44% of users. There has been a drop in the number of users without antivirus software, which is now down to 0.5%. 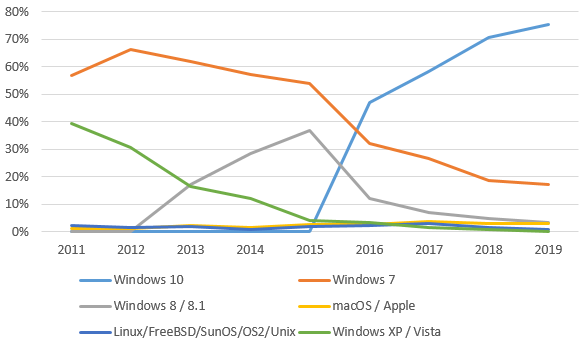 Over three quarters of this year’s respondents have moved to Windows 10, leaving Windows 7 with under a fifth of users. A little under a half of respondents (45%) use a Virtual Private Network (VPN). In Iran, UAE, Iraq and China, at least three quarters of users deploy a VPN. Google Chrome is the most popular browser, with getting on for half of respondents (45.6%) using it. Mozilla Firefox accounts for a lot of the remaining users, with a share approaching a third (29.2%). 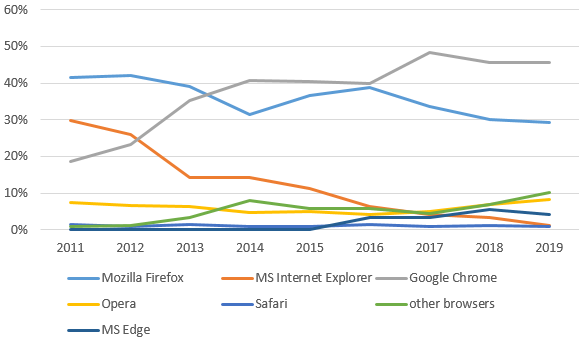 Despite being built into the increasingly popular Windows 10, and being Microsoft’s recommended browser on this OS, Microsoft Edge is only used by one in 20 of users overall. 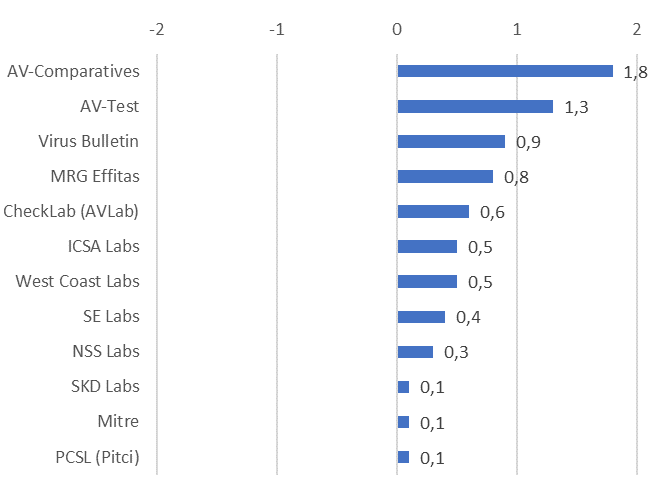 Some of the 13 test labs we asked users about were much better known than others, with 95% having heard of AV-Comparatives, but only 19% recognising the least well-known lab. As regards user confidence, once again we are delighted to be voted the most trustworthy and reliable of the testing labs, and thank respondents for their confidence in AV-Comparatives. Question 1: Where are you from? 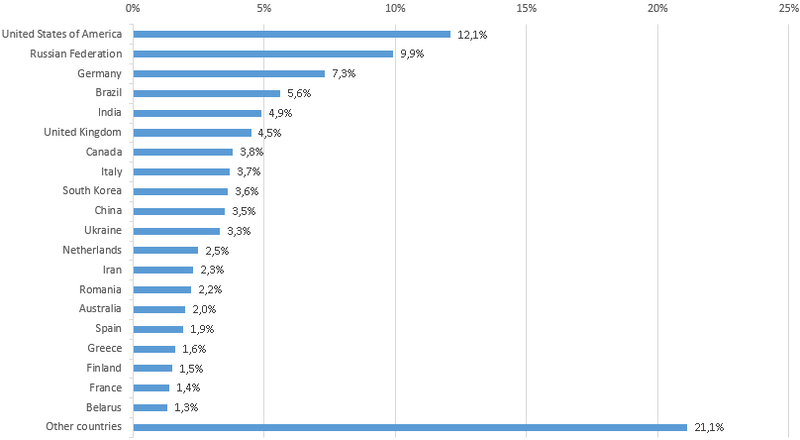 The graph above shows the top 20 countries of origin of our survey participants. Altogether, respondents came from 88 different countries. Age distribution by continent is shown below. Asia had the youngest respondents, with about 68% in the <25 and 25-34 brackets. North America had the oldest respondents, over 69% being in the 45-54, 55-64 or 65+ groups. South America had about 34% in the 25 to 34 age group and Europe had about 28% in the 35 to 44 age group. Question 3: Which type of security solution do you primarily use? Overall, 55.1% of users pay for a security solution. 0.5% of the users answered to do not use any security solution. In South America, most users (43%) use a Free Anti-Virus solution. In Asia, Free Internet Security Suites are very popular. Possibly due to the integration of the free Microsoft Windows Defender into Windows 10, compared to last year more people have moved to “Free Anti-Virus”. Question 4: Which desktop operating system do you primarily use? Question 5: Which browser do you primarily use? 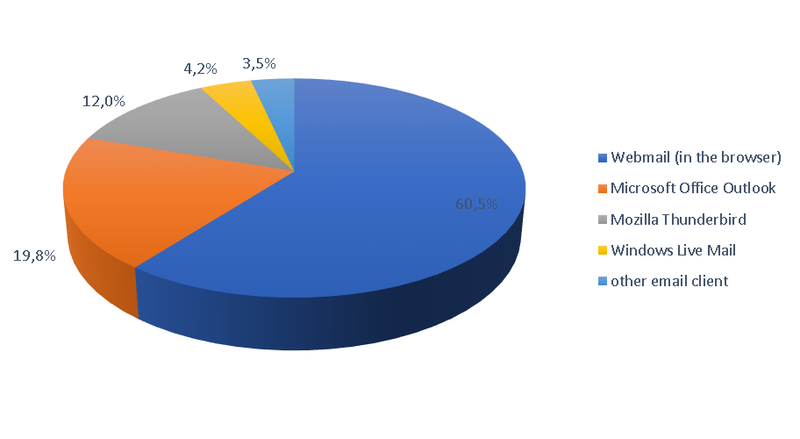 As shown in the diagram, Google Chrome (45.6%) is the most popular browser amongst survey participants worldwide, with almost half of the respondents using it. In second place is Mozilla Firefox (29.2%). In third place we find Opera (10% in Europe). The Yandex browser is very popular in Russia (18%). Even though more than 70% of survey respondents use Windows 10, only 4.2% of all participants use the Edge browser (mostly in North- and South America – 8%). Only 1.3% of survey participants still use the Internet Explorer browser. Question 6: Which mobile operating system do you use? Question 7: Which email program / email client software do you primarily use? 60.5% of all respondents read emails in a browser using webmail services such as Gmail, outlook.com, or Yahoo. Webmail is most commonly used in Asia, where 70% of users employ it. Microsoft Office Outlook is the most frequently used email client, with 19.8% of all users choosing it. It is particularly popular in North America, where it is used by exactly a quarter of respondents. Mozilla Thunderbird is the next most commonly used mail program, accounting for 12.0% of all users. This rises to 18% in Europe. 4.2% of all users deploy Windows Live Mail, and 3.5% other email clients. Question 8: Do you use a VPN and if yes, which one? According to the survey, almost 45% of users overall make use of Virtual Private Network software (VPN). VPNs are mostly used in Iran (95%), United Arab Emirates (87%), Iraq (84%), China (75%), Turkey 64% and Ukraine 60%. In most other countries only about a quarter to a third of users deploy a VPN. Interestingly, the countries in which VPNs have been banned, or bans have been attempted, are the ones in which they are most commonly used. Question 9: How did you choose your current security solution? Survey respondents clearly value independent tests very highly when it comes to choosing security software, with almost three quarters using these to select their security solution. Recommendations in online forums and from friends/family members then account for most of the remainder. We should point out that some of the forum members/family members/friends etc. may themselves consult independent test-lab results before recommending a product. About 7% of users stick to the security solution that came with the computer or operating system. The chart above shows the answers from the last 5 years. Question 10: Which mobile anti-malware security solution do you primarily use on your smartphone? 37.8% of respondents overall do not use any security solution on their mobile phones. Worldwide, the ten most commonly used manufacturers of mobile security products are, in decreasing order: Kaspersky Lab, Bitdefender, ESET, Avast, Symantec, McAfee, F-Secure, AhnLab, AVIRA and AVG. 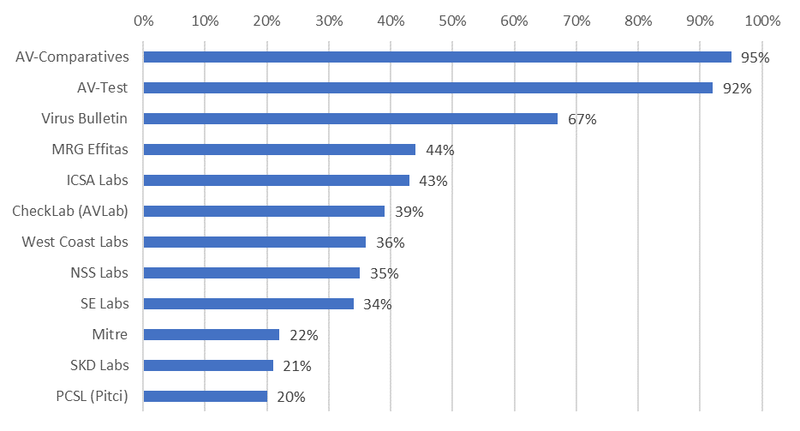 The list below shows the 10 most popular mobile security manufacturers used by survey participants, according to continent. There were not enough responses from some regions to produce significant results. Therefore, Australia/Oceania and Africa are not shown. Bitdefender and ESET were in the top three on all four continents with significant results, and Avast in the top four. Major products for mobiles were reviewed by AV-Comparatives in a report in 2018. Question 11: Which desktop anti-malware security solution do you primarily use? Worldwide, the twelve manufacturers of anti-malware products for Windows platforms most commonly used by survey participants are (in this order): Kaspersky Lab, ESET, Bitdefender, Microsoft, Avast, Symantec, AVIRA, F-Secure, McAfee, Emsisoft, Panda and Trend Micro. On all 4 continents, the same 5 vendors take the top 5 places. These are (alphabetically): Avast, Bitdefender, ESET, Kaspersky Lab and Microsoft. Question 12: Which CONSUMER/HOME-USER desktop security solutions would you like to see in our yearly public main-test series? Below are the 15 most-requested consumer/home-user products. Question 13: Which BUSINESS/ENTERPRISE desktop security solutions would you like to see in our yearly public main-test series? Below are the 20 most-requested business/enterprise products. Most of the popular vendors are usually included in at least some of our public tests and reviews, while some other vendors commission separate tests and/or participate privately in certain tests. Question 14: When was the last time that your PC was (unintentionally) infected/compromised by malware (i.e. that your security product failed to stop malware)? 3.2% of respondents stated that their security product failed to protect their system within the last week. About 86% stated that the last time their security product had failed to protect their system was either over six months ago or not at all. Question 15: When was the last time your security product found/blocked or warned about a malicious file/website (i.e. that your security product successfully protected your system against a malware attack)? About 1/3 of the users state that they encountered malware and that their security product successfully protected their system less than a week ago. 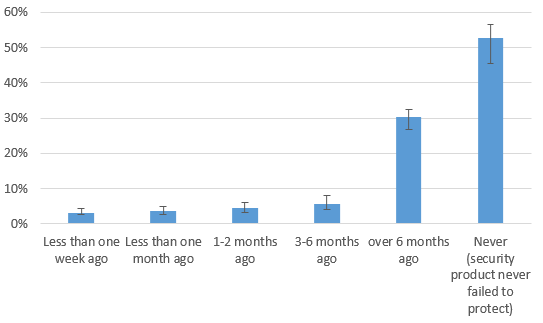 About 10% of the users said that the last time that their security product appropriately warned of/protected them against malware was over six months ago. About 8% have never had any warnings from their security product. The results of questions 14 and 15 together may provide some insight into the effectiveness of current security software. Question 16: When was the last time your desktop security product blocked a file or website which (as far as you know) was NOT malicious, i.e. a false positive / false alarm? The distribution is quite even, showing that false alarms are an issue which happens regularly, with some products more susceptible than with others. Question 17: Why did you think the detection was a false positive? 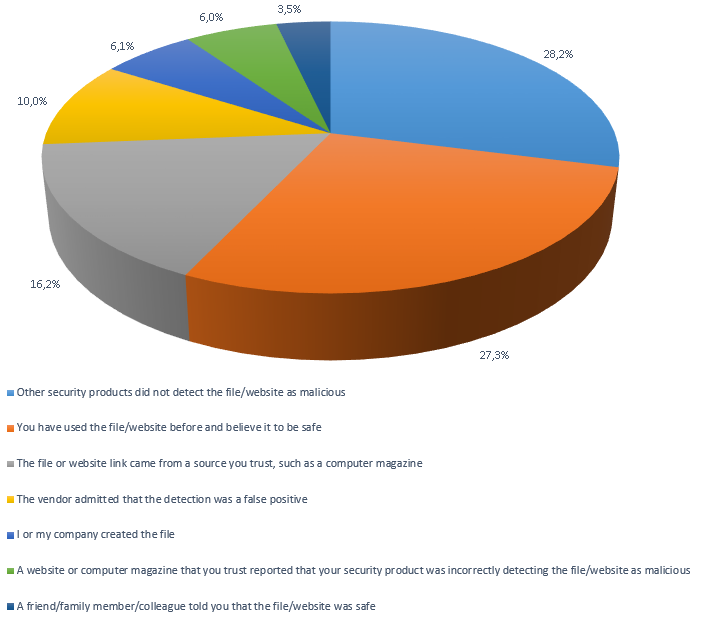 When asked why the people think that the detection was a false positive, 28.2% answered that other security products did not detect the file/website as malicious. Almost as many (27.3%) said that they had used the file or website before, and believed it to be safe. A smaller proportion (16.2%) stated that the file/website link came from a trusted source, such as a computer magazine. 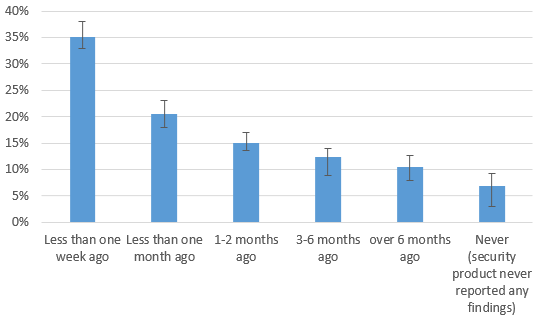 One in ten users said that the AV vendor in question had admitted that the detection was a false positive, while 6% reported that they (or their company) had created the file, and thus new it to be safe. The remainder, about 10% altogether, concluded the file or website was safe based on information from trusted websites/magazines/family members/friends/colleagues. Question 18: Please order the tests below from the ones you are most interested in to the ones in which you are less interested in. From 2019 onwards, the Malware Removal Test will no longer be a part of our Public Main Test Series. In its place, we will be running the Enhanced Real-World Test. Question 19: Which of the following testing labs are, in your opinion, reliable and trustworthy? Users had to rate various security product testing labs and institutes by giving a score from -2 to +2, where +2 meant reliable/trustworthy and -2 unreliable/biased. Note that not all respondents were aware of all the labs, so each lab was only rated by those who were aware of it. For more information, see next page. AV-Comparatives and AV-Test reached a score higher than 1. Together with Virus Bulletin, those are the three best-known AV testing labs in the world. We hope that our high rating is down to the carefully prepared methodology of our tests, meaningful number of samples, transparency, and freely available test reports, which describe the tests in detail. Our willingness to allow other publications to cite our results (subject to proper attribution) also increases our visibility. Which are the best-known AV testing labs? CheckLab (AVLab) and Mitre are new entries; CheckVir has been removed as it appears to no longer exist (as of January 2019). Please note that not all the testing labs have the same testing focus. That is to say, some may test only business products, others only consumer products; some may only provide certification (i.e. simply verify that products reach a certain minimum level, without providing comparative data); some may limit their tests to products from a particular country or region, or in a certain language.